In order to encapsulate VM functionality, PM is split in process management and memory management. The memory management task is called VM and implements the memory part of the fork, exec, exit, etc calls, by being called synchronously by PM when those calls are done. This has made PM architecture independent. 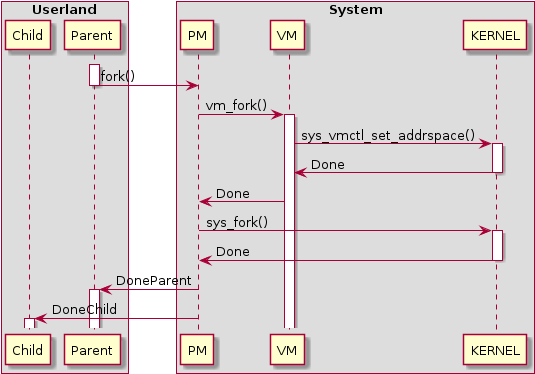 VM manages memory (keeping track of used and unused memory, assigning memory to processes, freeing it, ..). There is a clear split between architecture dependent and independent code in VM. For i386 and ARM, there are intel page tables that reside in VM's address space. 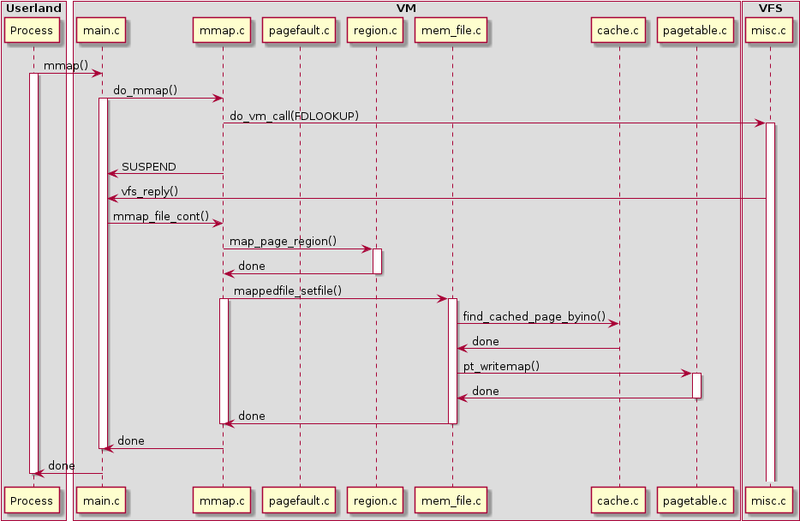 VM maps these into its own address space, by editing its own page table, so it can edit them directly. A region, described by a 'struct vir_region' or region_t, is a contiguous range of virtual address space that has a particular type and some parameters. Its type determines its properties and behaviour (see 'memory types' later). It needn't have any real memory instantiated in it (yet). At any time, a region is of a fixed size in virtual address space. Some types can be resized when requested (typically the brk() call) though. Virtual regions have a staring address and a length, both page-aligned. Virtual regions have a fixed-sized array of pointers to physical regions in them. Every entry represents a page-sized memory block. If non-NULL, that block is instantiated and points to a phys_region, describing the physical block of memory. Physical regions, described by a 'struct phys_region,' exist to reference physical blocks. Physical blocks describe a physical page of memory. An extra level of indirection is needed because it is necessary to reference the same page of physical memory more than once, and keep a reference count of it to (efficiently) know when a page is referenced 0, once or more than once. 'blocks' here can be used interchangeably with pages. A physical block, described by a 'struct phys_block,' describes a single page of physical memory. It has the address, and a reference count. Each memory type is described by the data structure struct mem_type in memtype.h. They are instantiated in mem_*.c source files and declared in glo.h (mem_type_*). This is neatly abstracts different behaviour of different memory types when it comes to forking, pagefaulting, and so on, making the higher level data structures and code to manipulate them quite generic. The in-VM disk block cache data structures and code to manipulate it is contained in cache.c. Each cache block is page-sized and is uniquely identified by a (device, device offset) pair. It furthermore has (inode, inode offset) as extra information but this is not guaranteed to be unique by VM, nor is it guaranteed to be present. the inode number might be VMC_NO_INODE, meaning the the disk block isn't part of inode data or its inode number isn't known (e.g. because it ended up in the cache through a block device and not through a file). The block contents are a 'Physical block' pointer, and being in the cache counts as a 'reference' in its refcount. Blocks are indexed by two hash tables: one, the (device, device offset) pair, and two, the (inode, inode offset) pair. A block is only present in the 2nd hashtable if it is in an inode at all (inode != VMC_NO_INODE). Furthermore cache blocks are on an LRU chain to be used for eviction in out-of-memory conditions. memory that is mapped physically, but readonly as it's mapped in more than once (shared between processes that have forked), and so can't be written to directly. 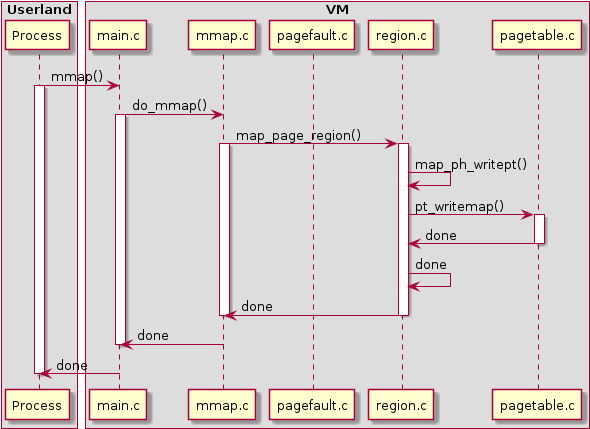 VM makes sure the page is mapped readonly in the second case. There is no page table entry in the first case. In both cases the 'call' is generated by the kernel and arrives in VM through a 'kernel signal' in the form of a message. The kernel must check for these cases whenever it wants to touch memory; e.g. in IPC but also in copying memory to/from processes in kernel context. If the kernel detects this, it stores this event, notifies VM, doesn't reply to the requester yet, and continues its event loop. 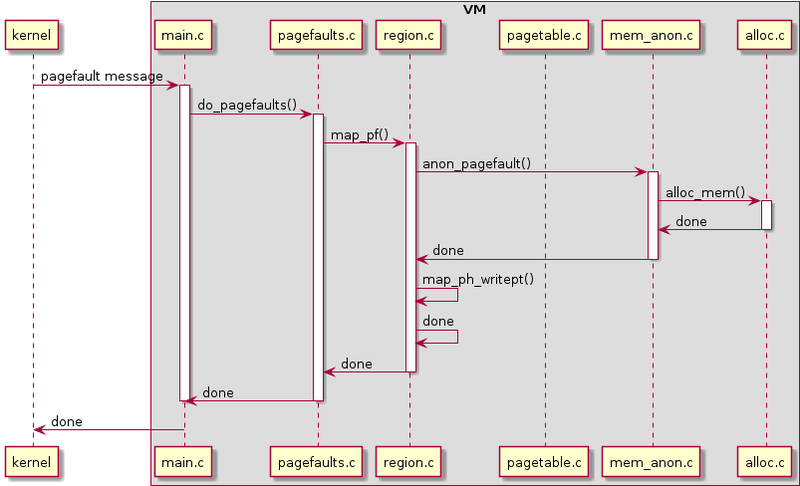 VM then handles the situation (specifically, mapping in a copy of the page, or an entirely new page, as the case may be) and sends a message to the kernel. If a pagefault is in a file-mapped region, the cache is queried for the presence of the right block. If it isn't there, a request to VFS will have to happen asynchronously for the block to appear in the cache. Once VFS indicates the request is complete, the pagefault code is simply re-invoked the same way. Processes that need physically contiguous memory specifically have to ask for it. 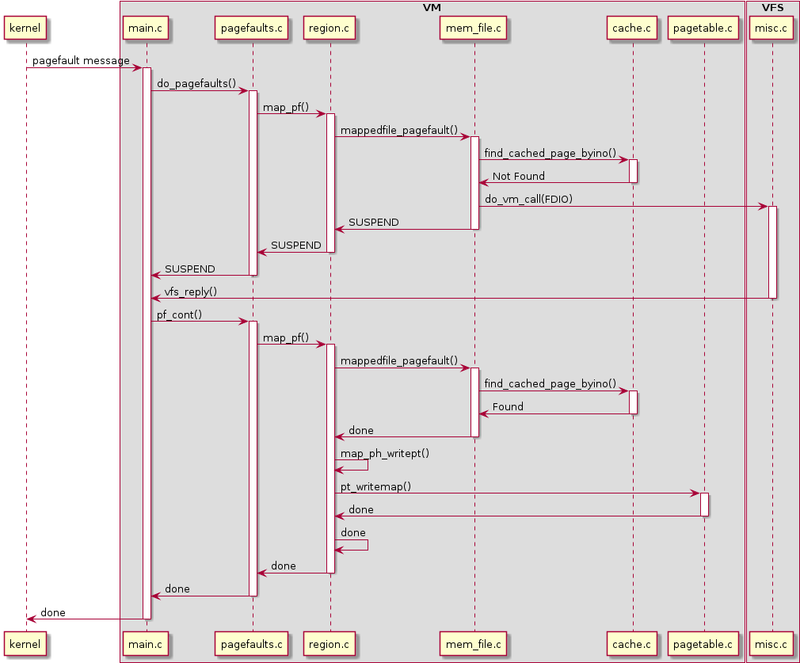 A warning in the kernel is printed if an old umap function is called. A new umap segment (VM_D as opposed to D) was added that does a physically-contiguous check, but doesn't print a warning (the VM_D is meant to indicate that the caller is aware that memory isn't automatically contiguous physically, and that if it wants it to be, it has made arrangements for that itself, e.g. use alloc_contig()).